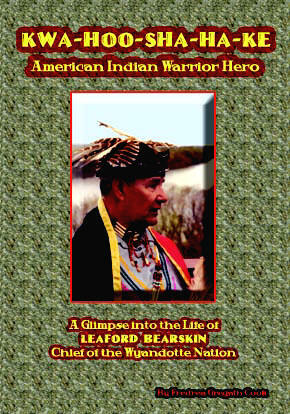 This book contains the basic life story of Leaford Bearskin, Chief of the Wyandotte Nation. It chronicles his life from boyhood through his Military, Civil Service, and now his tribal career. This book has been long in the making. The author’s friendship with Chief Bearskin has spanned many years and some interesting interviews and stories. The book is only a small portion of what makes the man. It was the author’s plan to touch on all three careers and some of the early childhood of Leaford Bearskin. We begin our journey through Leaford’s life with a very brief look at a part of his family, beginning with his grandfather who served during the Civil War and his wife. The book then looks briefly at his childhood and his life in northeast Oklahoma, as well as his quick transition into a life of adventure and service. With regard to the illustrious military service, of Leaford Bearskin, during two wars, followed by Civil Service, a separate book would be warranted. His exemplary service to the country is hard pressed to match. A true warrior, he has served to the best of his ability and asked nothing in return. He served with dignity and honor. As the author contacted various members and descendants of his flight crew, this became profoundly clear. His leadership went far beyond the cockpit of an aircraft. It went to the personal needs of his crew members, their families and descendants, the United States Air Force, and even further. Beyond his military service, he continued to work for the United States Air Force, in a Civil Service capacity. In doing research for this book, a multitude of other records dealing with the Wyandotte Nation have been located which are not a part of this book. It was never the intent to make this a book about the Wyandottes, however, his tribe does intertwine with his life, within the pages. History shows us that the people of the Wyandotte peoples have seen their tribal name spelled in a number of ways [“Wendat”, “Wyandot”] and although they never really accepted it, they have also been called Huron. For the purpose of this book, the name Wyandotte will be used, throughout, unless it is part of a quoted document.